This walk starts off through woodland coming out into open pastures and returns to Mytholroyd by walking along the canal towpath. About 3 miles, taking about 1½ to 2 hours. All on tracks and lanes, after rain, the canal towpath can get a bit muddy in places. The meadows on the River Calder are fabulous in Spring and summer; the architecture of the Chapel buildings at Brearley is wonderful any time of the year! Also watch out for the weir at Brearley. 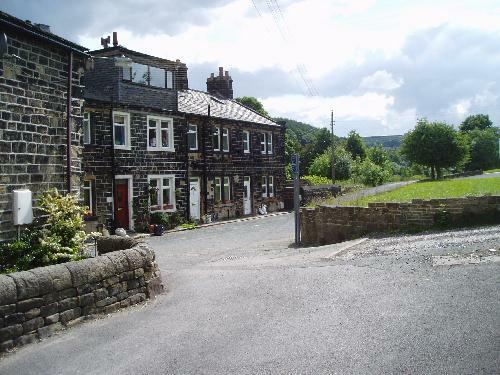 From the bus stops at Mytholmroyd, cross the bridge over the River Calder and head towards the train station. Just past the railway bridge you take the sloping path (with red painted railings) that leads up to the station platform. At the top of the first slope you will see a Mytholmroyd Walkers Action Board showing three longer walks in Mytholmroyd. Take the path to the right of our board. After a short time you come to a fork with the cycleway going to the left and a path going to the right, keep to the cycle way. The cycleway has a good surface following the railway line in between two wire fences for about a mile. The path then becomes a lane and crosses the railway line on a metal bridge. The lane goes down hill for 100 yards and then turns sharply to the right where it becomes a tarmac surface and you pass the fine buildings that used to be Brearley Baptist chapel, school and Manse (built around 1840). Continue on down the lane until you reach a cross roads. To walk back to Mytholmroyd, you turn left at the crossroads, immediately coming to a fine stone bridge over the River Calder. it is worth a look over both sides of the bridge http://buytramadolbest.com (but listen out for traffic). To your left is a quiet rural view of meadows and the River Calder, while on your right, the river has been tamed with a weir and sluices for the mills. These two views sum up the landscape of the Upper Calder Valley – time and again you will trip over bits of industrial archeology in what first appears to be a very rural landscape. Having crossed the bridge, you have a short incline to go up past the hamlet of Brearley and you turn left on to the canal towpath (watch out for the post with yellow waymarks on it). The playing fields on your left which were to be the site of the 1986 Yorkshire wind surfing trials (probably not a serious suggestion, but the playing fields do flood quite regularly). At Bridge number 9 you have to go off the towpath up a short incline (the path to the left is less steep), which brings you on to an access road. Cross the road and you will see a gap in the hedge where there is a path that takes you back on to the canal. As you pass some industrial units you are nearing Mytholmroyd (watch out for one very short uneven surface on the towpath). 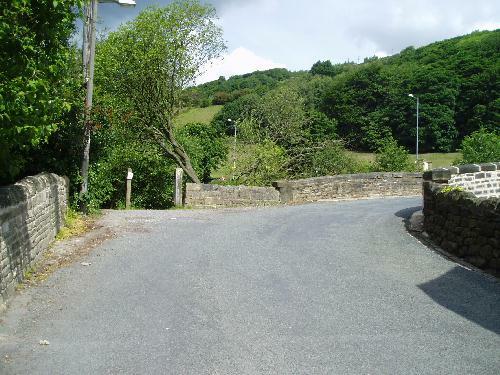 Go under bridge number 10 with some dwellings on the top and then you can reach the centre of Mytholmroyd by coming off the towpath at The White Lion or at bridge number 11 up a short flight of steps and left down Midgley Road.